"I'm not saying the kids were doing this in a mean way. They were just being normal dumb kids. I know that. I kind of wanted to tell them that. Like, it's okay, I know I'm weird looking, take a look, I don't bite. Hey, the truth is, if a Wookiee started going to the school all of a sudden, I'd be curious, I'd probably stare a bit! And if I was walking with Jack or Summer, I'd probably whisper to them: Hey, there's the Wookiee. And if the Wookiee caught me saying that, he'd know I wasn't trying to be mean. I was just pointing out the fact that he's a Wookiee. It took about one week for the kids in my class to get used to my face." - August Pullman, age 10. You know, it's not easy being a high school teacher. It's nightmarish to be an adult in a child's world - the gossip, the bullying, the high school politics, the raging hormones, the insecurities and ego surges; when you're a kid, you think the adults just don't "get it." But that's not it. I get it, I just know that there's little I can do about it. It's all so sensitive and difficult. 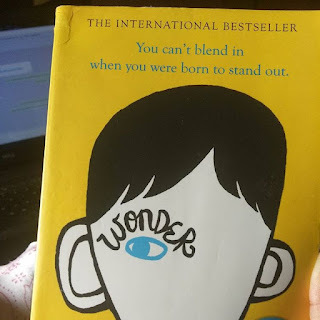 Wonder by R.J. Palacio taught me a lot about teenagers, in fact I borrowed it from one of my students. The book, and the fact that a bunch of teens in my class love it, has made me delve deeper into the teen psyche than ever before. You see, this book is not about a single experience, not about one child having a series of problems, or another creating a series. It's told from the points of view of many children, different perspectives on the same experience, and it's about how they all come together to weave that web of nastiness that is any school. It all begins with August Pullman, a boy born with a facial malformation, called a "mandibulofacial dysostosis" and described as much more drastic in appearance than a cleft palate. August opens the book with narration of his life story with a chilling matter-of-factly tone. Auggie is used to people being frightened of his face, he describes that reaction that people have, of shock and derision, often leading to pity, when people see him for the first time. He knows that some people can never look him in the eye, ever. He knows it, and he says it like he's accepted it... almost. August has been home-schooled till Grade 4, when his parents decide it's time for him to get a taste of the real world, with all its joys and difficulties. They enrol him into a private school, much to August's dismay. The director of the school, a nice ol' man comically named Mr. Tushman arranges for a visit to the school for August during the summer holidays. He recruits three prospective classmates to show him around the school. This is where August gets his first nasty surprise. The boys, who are absolutely sweet in the presence of the adults, commence casual snide remarks when alone with August - sample: referring to him as Darth Sidious with his burnt face. August is stunned, hurt. But he decides to go to school anyhow, because he likes it, and perhaps because he wants to face that challenge. The first day is no different from what you'd expect. August makes no friends, and the few he does make seem to be talking to him out of some sort of obligation. The meanest of the boys is this popular kid who should have no reason to pick on anyone, seeing as he is already on the highest rung of the social ladder. But somehow, he takes the keenest interest in making Auggie's life miserable. Come lunch break, when Auggie feels he is about to spend all of the school year alone, one girl, one of the "popular" ones comes up to his table and sits with him. And that makes him survive school for just that much longer. As August settles in, we take departure from his perspective and flit to his sister, Olivia. Olivia adores August, he is her everything. But it's hard having a younger sibling who has always been so sick, always been in and out of surgeries. Olivia has had to give up on her childhood quite young, and there is a certain apprehension caused by this, if not resentment. But her relationship with Auggie exudes warmth and she's fiercely protective of him, sometimes a little too motherly in her worry. You see, for all of August's troubles, he is not a special needs kid. He is just like a normal child, and quite a bright one at that, so he doesn't always need the coddling that Olivia imposes on him. Throughout the book, the brother-sister relationship develops in the most natural and beautiful of ways. We see other points of view as well. We see the story from Summer's point of view, that one popular girl who befriends August. And Jack, another of his friends. We meet Olivia's friends and her boyfriend. And in a special chapter at the end of the book, Palacio offers us a glimpse into the deep recesses of Julian's brain, August's greatest bully. Why do teenagers act the way they do - enough with the angst, damn it! Why do kids "hate"? How do children perceive loss - how do kids grieve? Can we focus on how deeply rooted peer pressure is? Do you become a bully by accident? Are bullies really also victims - as simple as that? Is it all hormones or do kids have problems as real as ours? If school is a test run for life, does that mean people never change - are we just a bunch of over-sized teenagers, just as mean, forever - no? ever met an angry gossipy parent? Now, the book doesn't give you answers to all these questions. But it damn well comes close. It provides much needed insight into the inner workings of different minds - many rights and wrongs. It readjusts your view on life, by giving you ten others. It tells you somehow that it's okay to not always be right, and not always be good, but we must keep trying to be both. No one is perfect, but that shouldn't be our cue to give up on ourselves. It's GUTTING but it's also heart-warming. So, after all the struggle and perseverance and the trials and tribunals of school, August, his friends and his enemies do make it through to the light at the end of the tunnel. As we all eventually do. So you might ask, that's it? Happy ending schmappy ending? Well, it's not a the-end-will-shock-you type of book, not some mystery that keeps you on the edge of your seat. It's the journey that matters. And the book takes us on a hell of a ride. Can we set aside a moment to appreciate how every teenage coming-of-age story has a teacher figure who majorly influences the main characters? Can I bask in how it's almost always the English teacher? I guess it's because we're not burdened with actual content to teach and can basically just come up with our own. It's also probably because writers tend to temp as English teachers and that could be where the bias forms. Anyhow, August has an interesting, if a little eccentric, character for an English teacher - Mr. Browne, who, among other things, makes it a point to start every month with a "precept" that he gives the students. Words to live by... These make for some interesting quotes. But what's more is, he asks the students to write their own precepts and as a finishing touch to this book, Palacio has given us the different precepts handed in by our characters at the end of the year. Yummy. I don't know what my students took away from the story. I don't know how much seeped in. I don't know if the story will change how they look at someone just a little more timid, a little more whimsical, a little more different. I can only hope that they will try on the boots of the August or Jack or Miranda or Olivia of their class and walk a mile. I can only hope that tomorrow, they will be a little less selfish, a little less ignorant, a little less resentful, a little less impatient - and the world will be a kinder place.